Jonathan Bairstow celebrates his 100 not out and reaching 7000 runs. I note from dispatches that your top-order batsmen seem to be struggling. Indeed, it appears that you are three-down for not very many on a regular basis. There is a chap at Yorkshire called Jonny Bairstow who can bat a bit. In fact, he has scored 906 runs in the County Championship this summer at an average of 100.66. His sequence of scores in the competition reads: 102, 59, 50, 66, 125*, 0, 15, 219*, 108, 23 and 139. I would therefore be most grateful if you could get him into your team for the third Ashes Test starting at Edgbaston on Wednesday week. His record would demand nothing less. AT the risk of being accused of bias, the case for Jonny Bairstow is incontrovertible. His outstanding record speaks for itself. As Yorkshire scored 357-5 on the opening day, Bairstow furthered already compelling claims with an innings of 139, his fifth century in 11 Championship innings to go with three fifties. It is a record that cannot be ignored by any fair-minded hierarchy. Not that Bairstow would bang his own drum. 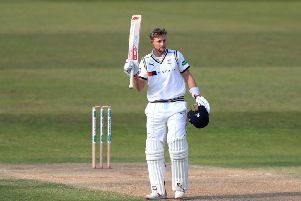 After recording his 16th first-class hundred, he played down talk concerning an England recall as skilfully as he played with a bat in his hand. “I think it’s time for us to get behind the (England) lads,” said Bairstow, who received staunch support from captain Andrew Gale, who scored an unbeaten 127, the pair adding 254 for the fourth-wicket. “It was only a week ago that people were right behind them after the win in Cardiff, and it’s very fickle of people to be saying there needs to be this and that. “We need to get behind the boys and back them to the hilt. Bairstow, who said he could not attribute his form to anything specific, came to the crease with Yorkshire 57-3. In fresh conditions, with rain preventing a start until 12pm, Yorkshire had run into early problems against Joe Leach, the former Leeds-Bradford pace bowler. Leach, 24, who looks older and is refreshingly well-stocked around the midriff, removed both opening batsmen inside the first eight overs. Will Rhodes was lured into a loose drive outside off stump and caught at first slip, and Alex Lees dismissed in similar style – albeit Ross Whiteley juggled the chance before eventually clinging on for the catch. Leach, who had done his damage from the Peasholm Park end, returned for a second spell from the Trafalgar Square end and pinned Jack Leaning lbw. Having lost the toss on a flat pitch, the early honours belonged to the visitors. It was the sort of situation, however, that invariably brings the best out of Yorkshire and, in particular, the best out of Bairstow. Jack Shantry, the left-arm pace bowler with a windmill action, was driven firmly to the mid-off boundary in an early warning sign. Brett D’Oliveira, the 23-year-old leg-spinner, was swatted for four through the offside too. By now, Bairstow had his eye in and the alarm bells for the visitors were ringing. How, they must have wondered, were they going to get him out? As the 2,450 crowd looked on, Bairstow, however, was no one-man band. Gale played wonderfully well too and seems to love Scarborough every bit as much as the Yorkshire supporters who annually make the pilgrimage here. He also relishes a scrap, and after he and Bairstow had lifted the score to 85-3 at lunch, they rattled along during the chanceless afternoon. Bairstow went to his half-century from 48 balls with 10 boundaries, and Gale followed him to the mark from 103 deliveries with six fours as he played the perfect foil. Then, just before tea, and coincidentally just as Jos Buttler was being dismissed during the Lord’s Test, Bairstow reached his hundred from 112 balls with 16 fours (if England do not pick Bairstow purely as a batsman, he could certainly replace Buttler as the batsman/wicketkeeper). After tea, Bairstow and Gale continued along. Bairstow offered a tough chance on 126 to D’Oliveira at cover off Shantry, the ball running away for two runs that took the stand to 212 and past Yorkshire’s previous best for the fourth-wicket against Worcestershire of 210 by Arthur Mitchell and Maurice Leyland, scored at Worcester in 1933. Gale, who played some meaty cuts and drives, went to his fifth hundred in first-class cricket at this ground from 183 balls with 11 fours before Bairstow finally fell with the total on 311, cutting D’Oliveira to backward point. Adil Rashid pushed Saeed Ajmal to slip, but Yorkshire already have the foundation for a fifth successive victory.